Ever since I was a child I’ve had to be vigilant in checking for ticks whenever I’ve been outside. I remember once I went for a bike ride and that night complained to my parents I had a big bump on my head. Well, it wasn’t just a bump. It was a tick that had decided I was a tasty treat. How it managed to drop on me while riding my bike I’ll never know. According to researchers from the University of California at Berkeley, sitting on a log for only five minutes provides a 30% chance of getting a tick on you. Luckily for me, my odds of getting a tick are much better. Our family went for a walk while visiting my parents in rural Nebraska a couple of weeks ago. After walking around their pond for 20 minutes, I went home and found two ticks crawling on me. No one else in the family had anything on them. They were apparently saved by the fact that all of the ticks went running to me. For those of you who don’t know, ticks are the leading carriers of diseases to humans in the United States. Worldwide, they rank second to mosquitoes. Of course, it’s not the bite that’s the problem it’s the toxins and secretions transmitted through the bite that causes disease. Like spiders, ticks are arthropods and there are more than 800 species throughout the world. Shortly after college, I worked for the National Park Service as a seasonal Park Ranger. I have plenty of stories that I’ll share from those experiences in later blog posts. Some of my favorite memories, though, are when we would have some good-natured fun with the park visitors. 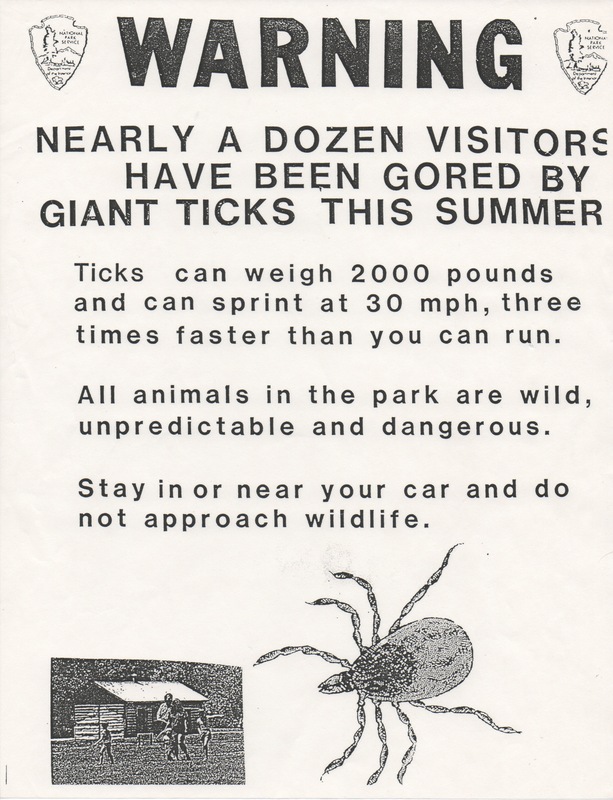 I didn’t realize how many people traveling our national parks were unaware of ticks. Since the park was a restored tall grass prairie, we had caution signs up that visitors should check for ticks after they have been out on the trails. The signage never really gathered a lot of attention until we found an old copy of a warning poster for buffalo that had been altered. I’m not sure who was responsible for changing the sign, but I thought it was funny so I started posting some of them around the visitor’s center. (Yes I realize that the quality was poor, but remember this was created before programs like Photoshop were around.) It was a great conversation starter and people got a kick out of it. It also taught me that there are way too many people who believe everything they read. Being a thoughtful college graduate, I took the same poster and used it to caution people about Park Rangers. I was hoping it would lead to fewer group tours on the hiking trails (and thus reducing my exposure to additional tick encounters) but people weren’t buying this version. Oh well. I continued to give tours, meet some fun people and scour my body looking for unwanted hitchhikers (and I continue to reserve my right to be wild, unpredictable and dangerous).